Elderberry. 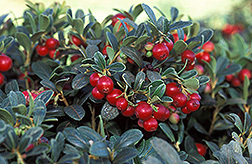 Lingonberry. Aroniaberry. Funny names, but these are three of the dozens of small fruits that researchers at the National Clonal Germplasm Repository in Corvallis, Oregon, are studying. The Agricultural Research Service (ARS) repository stores genetic material of better-known crops such as strawberries, blueberries, mint, and hops, but their work on minor fruits may be the most challenging. Descriptively, "minor" does not mean unimportant. The term defines crops grown on 300,000 acres or less in the United States. There are more than 600 such crops, many of them fruit. Combined, minor crops have a value of $40 billion, which equals 40 percent of all U.S. crop values. And in half the states, the value of minor crops is more than half the value of all crops. Several of the minor fruits being studied in Corvallis are grown on only a few hundred acres or are new to this country. The scientists are seeking major fruit crops from other countries to see whether they have potential in the United States. "The small fruits we're studying have unusual flavors and qualities, and many are rich with antioxidants," explains Kim Hummer, research leader and curator for the repository. An example is the black raspberry, which has the highest anthocyanin level of any temperate fruit. Anthocyanin is a flavonoid, one of the components that give fruits and vegetables their color. Antioxidants—such as vitamins C and E as well as flavonoids—are found in many fruits and vegetables in various concentrations. Antioxidants are believed to lessen one's risk of getting heart disease and high blood pressure. The compounds may also slow or even prevent formation of cancer. Hummer and her staff collect and maintain plants and seeds of many minor fruit crops and collect the germplasm of many others. The repository distributes cuttings and seeds to breeders across the country to see which types of plants grow best in which region. They are also growing some in Corvallis. 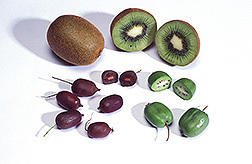 An example of successful minor-fruit introduction is the kiwifruit, which originally came from China. Before 1970, it was an obscure fruit. Now it can be found in most grocery stores throughout the United States and the world. The repository is now studying a new species of hardy kiwifruit. It has smooth skin and is the size of a grape, but it has green flesh and black seeds similar to its larger, fuzzy-skinned cousin. Even though there are only a few hundred acres of the crop in Oregon, Hummer believes that may increase. Geneticist Chad E. Finn, who works across town from Hummer at ARS's Horticultural Crops Research Laboratory, is evaluating some of Hummer's crops. 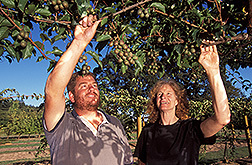 The main cultivar of hardy kiwifruit has two major problems: its small size and a 2-month marketing window. It ripens in mid-September and can be stored for only a few weeks. "We're trying to identify genotypes that are the size of large cherries and ripen earlier in the summer, thereby extending the fresh-market season," says Finn. Another fruit being researched is the edible-fruited honeysuckle. Even though few acres are grown in the United States, the fruit may become popular in the future, since it is eaten in several Asian countries. Many people say that honeysuckle fruit tastes and looks like cylindrical blueberries. This species is quite different from the native American ornamental honeysuckles. Some minor crops are popular in certain areas of the country, and the Corvallis scientists are trying to help test them in other locations. A good example is elderberry. Its juice is used in jams and some Midwest wines, but this fruit may grow well in the western United States. 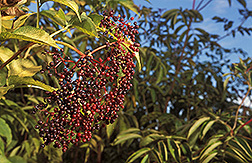 Various ethnic groups throughout history have thought that elderberry had medicinal or even supernatural powers. There are also unconventional uses for minor fruits. "Many homeowners are searching for 'edible landscapes,' and these fruit crops are ideal candidates," Hummer says. Aroniaberry is one such plant with good ornamental value. It can be grown in many environments, whether next to a pond or alongside a highway. And several commercial sources now make and sell aroniaberry juice.—By David Elstein, Agricultural Research Service Information Staff. 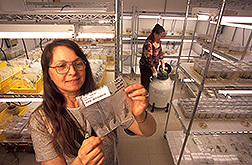 Kim E. Hummer is with the USDA-ARS National Clonal Germplasm Repository, 33447 Peoria Road, Corvallis, OR 97333; phone (541) 738-4201, fax (541) 738-4205. The National Clonal Germplasm Repository at Corvallis is one of about 30 sites that make up the U.S. National Plant Germplasm System. These sites are managed by ARS and in many cases cooperate with land-grant universities. 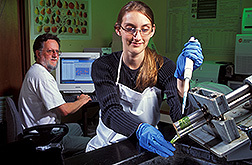 The Corvallis repository preserves and stores genetic resources of thousands of varieties of crops such as pears, strawberries, blueberries, mint, and hops. Not only does the repository try to collect every significant variety of the crops that they are responsible for, but they also distribute cuttings and seeds to researchers around the world. Some of their crops are grown in orchards. Corvallis is home to the more than 1,000 varieties of pears from all over the world. While they're all the same genus and the fruit grows on trees, that's where their similarities end. The pears appear in all shapes and colors, and each has a unique taste. To preserve this material, the repository has tissue cultures for backup and plant distributions, cryogenic preservation for very long-term storage, a genetics laboratory for identifying the fruit, and a plant pathology laboratory to test plants for viruses and to develop clean material. can grow in cooler climates. (K11679-1) They acquire varieties of fruits and nuts from around the world to keep the diversity of the various species alive. This treasure trove of genetic diversity is a valuable resource to researchers and breeders. It could be used to regenerate crops in case something disastrous harms the current supply. Over time, certain varieties are used more than others in commercial plantings. This results in less genetic diversity, which could leave large portions of crops vulnerable to newly emerging pests and diseases. Keeping diverse collections makes sure species will live on.—By David Elstein, ARS. 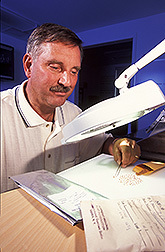 "Turning Minor Fruits Into Major Crops" was published in the January 2005 issue of Agricultural Research magazine.